Varicose veins are an incredibly common problem. An estimated 20-25 million Americans suffer from this disease. Varicose veins are uncomfortable, painful, and unsightly. Though you cannot wish these sinewy veins away, there are exercises that can alleviate the pain. We’ll review the best exercises for varicose veins and explain what causes varicose veins, and how to treat them if exercise fails. Low-impact exercises are best if you are suffering from varicose veins. Such exercises help ease the discomfort and pain caused by varicose veins and keep them from becoming worse. You can also consult vein specialists who can advise you on the best form of exercise and options for treatment of varicose veins. Bicycling is great for exercising your calf muscles. Even if you cannot actually ride a bike, you can ride a stationary bike or an elliptical. Even if these gym equipment are not accessible, you can mimic the cycling action at home. While lying on your back, pedal your legs slowly. This form of exercise is good for your leg veins. Regular walking for at least 30 minutes a day for 5 days a week can help relieve the pain caused by varicose veins. Walking is a low-impact exercise that has minimal impact on your joints. Walking is any day better than sitting or standing and it is the best exercise for your legs muscles. Running is also beneficial, but try to run on a synthetic track or a grass surface. With most people spending their entire work-day in front of their laptops, sitting on a chair, leg lifts are an easy exercise to do ‘on the job’. Sit with your back straight. Lift one leg straight up. Hold it for some time. Bring it down slowly. Now repeat with the other leg. Leg lifts can be done sitting or standing. This form of exercise promotes blood circulation in your leg veins. Stand upright with your legs apart. Step forward and bend your knee. Position your knee directly above the ankle. Hold for few seconds in this position. Slowly straighten your leg and get back to the initial position. Repeat this routine with the other leg. As you stand with your legs straight, rise slowly on tiptoes and then get back down. You can always approach your vein doctor at the Vein treatment clinic near you to suggest the best exercise for varicose veins. What are the exercises to avoid if you have varicose veins? All strenuous and high-impact form of exercise should be avoided if you have varicose veins. Though jogging and running are excellent aerobic exercises for your calf muscles, they have an adverse effect on your joints and leg veins. Weightlifting is another strenuous activity that will strain venous circulation. When you lift weights, the pressure on the abdomen increases and this impedes the flow of blood to the heart. The venous blood collects in your leg veins increasing the venous pressure and venous reflux, causing varicose veins in the leg. If weightlifting, opt for low weight-high rep routines. Avoid practicing yoga with prolonged abdominal postures. Also avoid crunches, and sit ups. You should know that when exercises don’t work (and they often don’t), there is no need to panic or be disheartened. There are a number of options for treating varicose veins without resorting to surgery. If you are looking for a vein doctor in New York or a Vein doctor in NJ, visit the Vein Treatment Clinic located nearest to you. The clinic boasts of a panel of Ivy-League educated, nationally-recognized vein doctor or phlebologists specialized in different areas of venous treatments. They are Board-certified and are in tune with the latest technological advances in treating varicose veins. What are varicose veins and how are they caused? Varicose veins are those veins that are stretched or enlarged because of blood that pools up in the legs. When the leg muscles cannot pump back the blood to the heart (usually due to a sedentary lifestyle), the blood gets collected in the veins in the leg, making them bulge. They also cause leg cramps, numbness, burning, and itching in the legs muscles. You can discuss your symptoms with a qualified vein doctor in NY or Vein doctor in new jersey. Though there’s no surefire way to prevent varicose veins. you can reduce the risk of getting them by improving circulation of blood with the best exercise for varicose veins. If you already have varicose veins, these exercises can help you manage the pain and discomfort. Any tips to prevent varicose veins? If you are unable to exercise due to age, illness, or a health condition, there are some alternatives that can be performed while standing or sitting. Try to wear compression hose while travelling, standing or sitting for a long period of time, and during pregnancy. Wear high-heeled footwear only on rare occasions. The position of your feet in such footwear will weaken your calf muscles. Rock your feet from toe to heel, back and forth. This simple exercise activates the calf muscle. What are spider veins? How are they different from varicose veins? Spider veins are small dilated veins, typically less than 2 mm in diameter, near the surface of the skin. These veins appear most often on the face and legs. Spider veins are caused due to the pressure exerted by the circulation in the veins. In women, they are a result or hormonal changes that are caused by pregnancy. Spider veins are often treated with sclerotherapy. Varicose veins are bulging blue blood vessels that appear twisted and can be felt and seen under the surface of your skin. They cause swelling and a heaviness in the legs muscles. Treatment is necessary because they can lead to blood clots or sores. 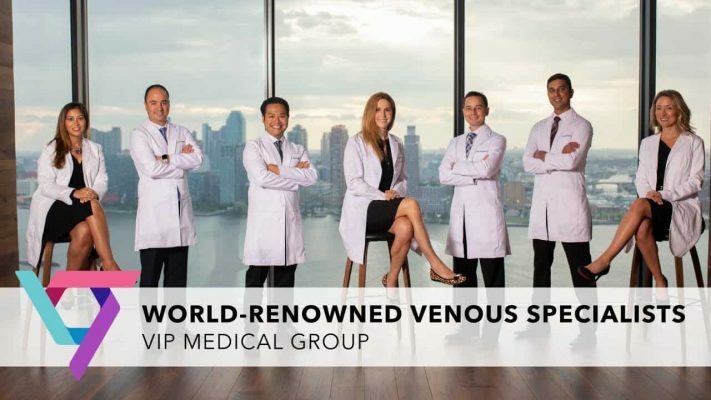 If you are not sure if you have spider veins or varicose veins, do consult a vein doctor in New York or a Vein doctor in NJ. Regular exercise is the best natural remedy as it improves blood circulation. But there are other ways believed to help manage the painful condition. Knee-high compression socks are easily available in pharmacies. They aid blood circulation by applying pressure on the legs and causing the veins to transport blood towards the heart. Studies indicate some reduction in pain. But these socks don’t address the core issue. Venous insufficiency is the chief cause of varicose veins. The pain, heaviness and itching may be reduced by using horse chestnut essential oil that is available in health stores. Apple cider vinegar is advertised as a cure for spider veins. A compress of apple cider vinegar, when applied twice a day to spider veins is expected to improve blood circulation and treat the veins There is no evidence that this works, but it may help reduce irritation from veins. Reduce the intake of food with high sodium content so that water retention is minimized. Consume potassium-rich food such as nuts, lentils, beans, potatoes, salmon, and tuna. Constipation causes straining that can worsen the condition of damaged valves. Eat fiber-rich food such as oats, flaxseed, nuts, whole grains, and seeds. Losing excess weight can relieve discomfort and swelling caused by varicose veins. Flavonoids are present in vegetables such as spinach, broccoli, peppers, onions, citrus fruits, apples, blueberries, cocoa, and garlic. Flavonoids improve blood circulation and reduce blood pressure which in turn reduces varicose veins. Keeping the legs elevated, preferably at the same level as your heart can reduce pressure on the leg veins. This is especially important for pregnant woman because it will help them improve blood circulation. Though exercises help provide some relief to those who are suffering from varicose veins, treatment is necessary to get better relief from pain. Your vein doctor New York or the expert vein specialists from can advise you on the appropriate varicose vein treatment for your condition. There are several treatment options that are effective in treating varicose veins without requiring sedation. The procedures are usually non-invasive and are performed in the clinic. The time for recovery is minimal and you could get back to work within hours. The vein specialists will choose a treatment plan that will prove effective for your specific case. Sclerotherapy is a procedure of injecting a salt solution into the vein, thereby causing the lining of the blood vessel to collapse and the blood to clot. Another form of treatment is using lasers on the surface of your skin or with intense pulsed light. Radiofrequency ablation, RFA, is a treatment procedure which is employed for reducing pain. Radio waves are used to generate electric current and this heats a small area of nerve tissues. This helps reduce pain signals from that particular area. RFA is a safe way to treat pain caused by varicose veins. Venaseal is an adhesive that can be injected to treat the cause of varicose veins. This is a non-invasive procedure. It can reverse the venous reflux in the small and great saphenous vein. Venaseal is a FDA-approved device for permanent treatment of varicose veins. This is the latest and the fastest technique for treating varicose veins. This endovascular procedure is faster than the conventional procedures. This minimally invasive Endovascular Laser Ablation is a highly effective procedure. Energy from a laser is used to make the vein collapse quickly. The vein eventually disappears.